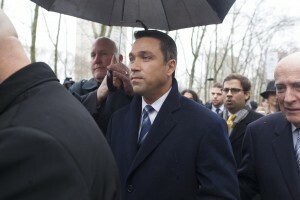 NEW YORK — After pleading guilty to tax evasion last week, U.S. Rep. Michael Grimm vowed to stay in Congress as long as he could. The New York Republican now plans to resign, saying he cannot give the job his full attention anymore. Grimm issued a statement late Monday saying he will resign effective Jan. 5. Grimm’s guilty plea last week to aiding in the filing of a false tax return came after he was re-elected to his Staten Island seat in November, even though he was under indictment. Grimm reportedly talked with House Speaker John Boehner, R-Ohio, before deciding to step down. Boehner has forced other lawmakers to resign for lesser offenses. The new Congress is scheduled to open Jan. 6, and Grimm’s presence would have been a distraction for Republicans who will control both the House and the Senate. House Minority Leader Nancy Pelosi, D-Calif., and the Democratic National Committee had called on Grimm to resign. A former Marine and FBI agent with support from former New York City Mayor Rudolph Giuliani, Grimm was elected to Congress in 2010, scoring an upset win over first-term Democratic Rep. Michael McMahon. According to an indictment, the tax fraud began in 2007 after Grimm retired from the FBI and began investing in a small Manhattan restaurant called Healthalicious. The indictment accused him of underreporting more than $1 million in wages and receipts to evade payroll, income and sales taxes, partly by paying immigrant workers, some of them in the country illegally, in cash. Grimm’s sentencing is scheduled for June 8. Prosecutors said a range of 24 to 30 months in prison would be appropriate, while the defense estimated the appropriate sentence as between 12 and 18 months. After his court appearance last week, Grimm said he planned to stay in Congress. “As long as I’m able to serve, I’m going to serve,” he said. He also apologized for his actions. “I should not have done it, and I am truly sorry for it,” he said. In his statement Monday, Grimm said he made his “very difficult decision … with a heavy heart” after much thought and prayer. The Daily News of New York first reported Grimm’s plans to give up his seat.